Combine the coconut milk, chicken broth, lemongrass and ginger in a large pot. 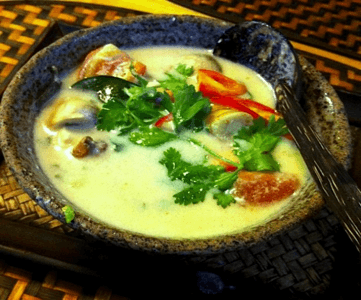 Bring to a simmer, stirring frequently or the coconut milk will curdle, and cook for 15 minutes. Add sliced chicken, fish sauce and chili peppers, bring to a boil, then simmer until chicken is cooked all the way through. Add lime juice, stir well and serve garnished with cilantro sprigs.